A Lift chair is a type of recliner that has a motorized lifting base. When the chair is fully raised, the chairs occupant can easily come to a standing position. Lift Chairs also allows an individual to sit in a safe and controlled manner. Will My Lift Chair Be Covered By Medicare? Medicare only partially covers the cost of a lift chair and will usually provide up to $300. The reason the full cost of the chair is not covered is because Medicare will only provide reimbursement for the lifting mechanism in the lift recliner. The lifting mechanism is what actually lifts the chair into the air. What Type of Lift Chairs Are Covered By Medicare? Medicare will only cover lift chairs that use a lifting mechanism that can be operated in a smooth and steady fashion. Some older lift chairs had used a kind of spring lifting system to raise the chair, but this type of system proved to be extremely dangerous and is not covered by Medicare. 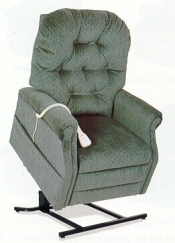 Instead, the lift recliner must use an electrical lifting system in order to qualify for Medicare Reimbursement. The Insured must suffer from arthritis or some other type of ambulatory disorder that makes them unable to stand on their own. This is not limited only to certain chairs, but must be true of all chairs in the insured’s home. The Insured must be able to use and operate the lift chair independently and once upright they must be able to stand and walk without the assistance of a caretaker. A Doctor’s Prescription is necessary to receive Medicare reimbursement for any type of durable medical equipment. The lift chair must be part of a prescribed treatment to ensure that the patients condition does not get worse. A Certificate of Medical Necessity is simply a more detailed prescription that must be filled out by a physician and is required to receive coverage for a lift chair. If the insured meets all of the above requirements, they will be able to receive partial reimbursement for a lift chair. In order to receive a lift chair in a timely manner, most people choose to purchase the chair first and then apply for reimbursement later. You will need to have proof of purchase for the chair, which will be provided from the dealer. Most dealers can also provide a Certificate of Medical Necessity for your doctor to fill out and sign.